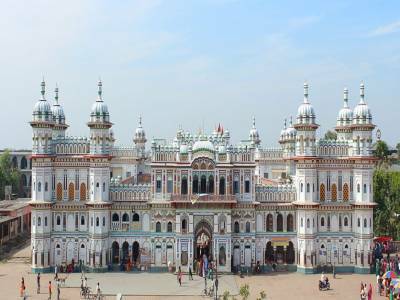 Janaki Devi Mandir or The Temple of Goddess Janaki is a massive white marble domed building dedicated to Hindu goddess Sita in the Janakpur region of Mithila district in Nepal. In mythological times with Ramayana as reference for timeline, King Janak, a famed ruler loved and renowned for his reputation of delivering unbiased justice, is said to have ruled this area of Janakpur, then known as Videha. Sita was King Janak's daughter whose name was Janaki and in a rather elaborate groom choosing ceremony, she decided on Lord Ram to be her husband and became Queen of Ayodhya, Sita Devi. A temple nearby, in same vicinity, is said to be the exact spot where their marriage vows were solemnized. 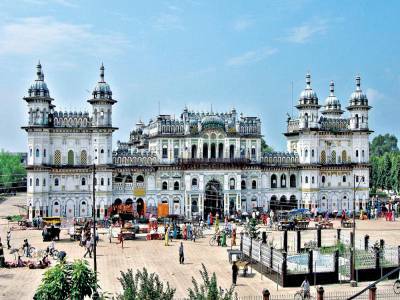 The Janaki Devi Mandir is a sprawling structure with palatial features and completely white in colour constructed completely from stone and white marble. 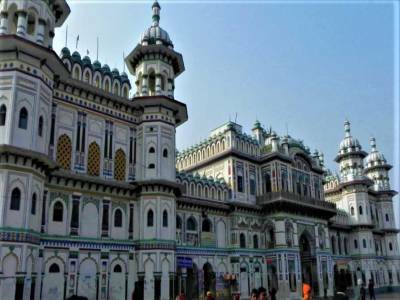 It is resplendent with domes at the top and the architecture is an interesting confluence of the Hindu Nepali Koiri and Mughal style of design. 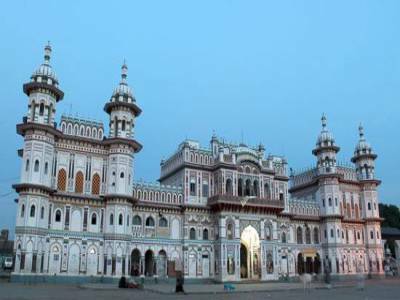 The temple is also popularly known as Nau Lakha Mandir because of the reference to enormous amount of money which was spent to construct this marvellous structure. Nine lakh rupees were spent in constructing this temple by the then queen of Tikamgarh Vrish Bhanu. She ordered commencement of proceedings, oversaw its construction and finally had it completed and erected in 1910. This site is a very revered and sacred spot for pilgrimage and extremely place for Hindu religion attracting numerous tourists from all around the country and world every year. However, the temple sees a considerable traction in footfall during important festivals of the Hindu calendar like Tihar, Dasai and Ram Nawami to name a few. However, the temple has suffered some considerable damage during the recent earthquakes that triggered an uncontrollable spate of destruction and collapse in Nepal. 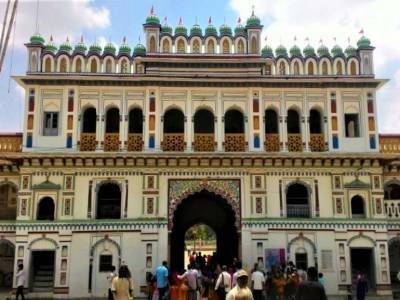 Get quick answers from travelers who visit to Janaki Devi Mandir.